Far more than continuing settlement construction, the road plan marks an entirely new chapter in the almost 50 year campaign to integrate the contested region irrevocably to Israel. Roads are the lifeblood of Israel’s ability to expand settlements and therefore to realize the grand strategy of de facto annexation. The extraordinarily successful settlement project boasts a current population of more than 600,000, growing at twice the national average and comprising nearly 10 percent of Israel’s Jewish population. This enterprise requires an ever-expanding infrastructure—particularly a modern road network—to accommodate continuing growth, not only of the settler population, but, as this new plan illuminates, the role of a modern West Bank road network in the national transportation requirements of Israel itself. This integration has evolved over almost half a century of colonization. 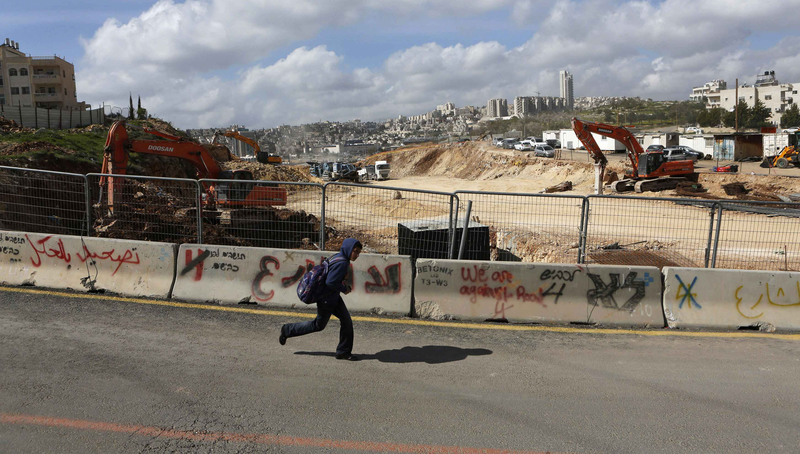 For the first 20 years of occupation, the road network Israel inherited in the West Bank, and to a large extent in East Jerusalem, proved adequate to the needs of Israel’s still fledgling settlement enterprise. The relatively small number of settlers were accommodated by a West Bank transportation network based on minor improvements to the winding two-lane Route 60 running from Nablus in the north to Hebron in the south. Route 60 and the lateral east-west roads attached to it were used by everyone, Israeli and Palestinian alike. Even during the First Intifada, settlers from the hilltop settlement of Pesagot overlooking Ramallah, for example, made their way through al-Bireh to the settlement by following a yellow line painted in the center of the road. As a frequent visitor to the area, I followed the yellow line myself. This inherited transportation network, however, was a reflection of the modest requirements of the Palestinian community in the early 20th century rather than the needs of an occupying army embarking upon the creation of a new settlement map. Settlement expansion during the 1970s concentrated upon establishing settlements in strategically and historically significant locales. The success of this program lead in 1984 to the publication of Road Plan 50—the crystallization of Israel’s intention to construct a purpose-built network of roads to facilitate settlement expansion. Shehadeh’s concerns reflected Palestinian fears, and Israel’s intent, that Palestine’s ability to wrest sovereignty, economic development, and control over its national territorial resources would be fatally undermined by the construction of a purpose-built system of roads designed to foster the expansion of settlements. By 1992, Road Plan 50 was re-christened the Great Roads Plan, more popularly known as the “intifada bypass” road plan, a reference to the need to construct roads around unruly Palestinian locales like Ramallah and al-Bireh to enable settlers to safely travel to and from their new homes. The Oslo process that commenced in 1993 changed neither the dimensions nor the objectives of Israel’s settlement enterprise, the creation of a new road network included. But the Clinton administration considered these roads security-related expenditures rather than settlement-related allocations. The United States thus excluded from loan guarantee penalties hundreds of millions of dollars’ worth of expenditures to establish a modern, purpose-built transportation grid for settlements. When many of the new bypass roads were first constructed, opponents of such expenditures often published pictures of the all but empty thoroughfares constructed to a scale far greater than the settler population of the time required. No longer. Today, tens of thousands of settlers make an often lengthy and congested commute to work places in the Tel Aviv metropolis and Greater Jerusalem. The new Route 60 funnels traffic from the West Bank heartland onto an overburdened road network in East Jerusalem. The Tunnels Road connecting settlements south of Jerusalem to the city is a parking lot during rush hours. The Mt. Scopus Tunnel carrying the almost 50,000 residents of Ma‘ale Adumim, and Route 55, the four-lane artery linking the Ariel and Shomron blocs to the central coastal region, boast tie-ups that can rival those of Tel Aviv. The newly announced billion dollar plan aims to address these growing pains. As with similar projects in the Galilee and Negev, newly accessible West Bank settlements will draw new residents and economic development. Settlements like Ma‘ale Adumim, Beitar, Givat Ze’ev, and Modiin IIlit will become bedroom suburbs. Settlements like Ofra and Ariel will be within an hour’s drive from Jerusalem and Tel Aviv respectively. Formerly isolated settlements will be isolated no more and outposts, whether illegal or “authorized,” will grow into settlements. The plan’s major road improvements, including dedicated transit lanes, mass transit, and highway expansion, are fully funded. When completed in the next few years, limited access highways will enable seamless travel to Jerusalem from settlement blocs to its north, east, and south. Light rail will speed settlers to Jerusalem and the coastal plain. News reports boast that settlers throughout the West Bank will be able to travel to the coastal metropolis without stopping at a single traffic light. The plan also expands the use of bypasses around Palestinian towns, including cities like Nablus and nearby villages like Huwarra, and Nabi Ilyas near Qalqilya. Bypasses will be built south of Jerusalem to avoid the village of Beit Ummar, with its long history of conflict with settlers from the Etzion Bloc and the army, and the al-Arroub refugee camp. The bypass routes address a growing settler population’s need for safer, modern transport routes. They also serve to largely exclude Palestinians, tied to a declining and increasingly peripheral road system, from the economic benefits new roads attract. These projects will be completed during the five-year term of the plan. Still on the drawing board is the already well-advanced transformation of Route 60 from a local West Bank trunk road to a national multi-lane highway running from Ariel in the north to the Beersheba region in southern Israel. The creation of this route is meant to carry traffic not only from settlements, but also from the major congested routes in the narrow waist of Israel itself along a parallel highway bisecting the West Bank. Expanding Israel’s population east of the restricted confines of the coastal metropolis has been a driving strategic objective since 1967. Completion of this new road plan will bring Israel a giant step closer to realizing this objective.